For the second year, Vogel Orchard will open for the Fall with a real pick-your-own pumpkin patch, a Fall store, pumpkin and scarecrow decorating for the kids, antique tractors, pumpkin chunking, and more. You and your family will be able to pick your own pumpkin from 5 varieties in their expanded patch or buy them already picked. They will be open Fridays, Saturdays, and Mondays from 9:30 am to 5:30 pm, and Sundays from 11:30 am to 5:30 pm, through October 31. 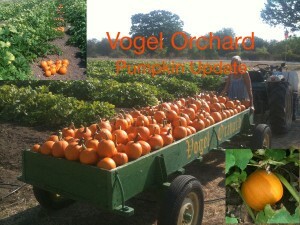 Vogel Orchards is 2 miles west of Stonewall and 12 miles east of Fredericksburg on US Hwy 290.